In this study, amine functionalized Kit-6 silica mesoporous magnetite nanocomposite (NH2-MMNC) was synthesized by chemical methods and used as an efficient and recoverable adsorbent for removal of Ponceau 4R, as a toxic dye, from aqueous solutions. The synthesized nanocomposites were characterized by XRD, FT-IR, BET and SEM instruments. The effect of various experimental parameters on the dye removal efficiency was studied using Taguchi orthogonal array design (L9 array) method and under optimum conditions (pH = 2, adsorbent amount = 80 mg, stirring time = 30 min and without addition of salt) removal efficiency higher than 98% was obtained.The kinetic studies showed rapid sorption dynamics by a second-order kinetic model with R2=0.9993 and qeq= 58.8 mg g-1, suggesting chemisorption mechanism. Dye adsorption equilibrium data were fitted well to the Langmuir isotherm and the synthesized sorbent showed complete removal efficiency. The maximum monolayer capacity of the sorbent (Qmax , mg g-1), and the Langmuir binding constant which is related to the energy of adsorption (KL, L mg-1), were obtained as 87.7 and 0.407, respectively. The results of real samples show that the synthesized nanocomposite can be used as a recyclable and efficient adsorbent for removal of Ponceau 4R anionic dye from aqueous solutions. 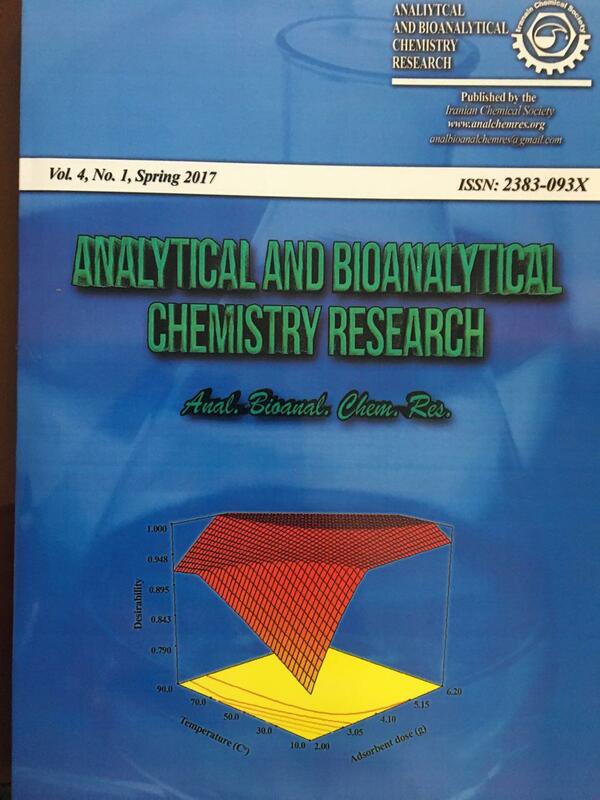 E. Dinc, E Baydan, M. Kanbur, F. Onur, Spectrophotometricmulticomponent determination of sunset yellow, tartrazine and Allura Red insoft drink powder by double divisor-ratio spectra derivative, inverse leastsquaresand principal component regression methods, Talanta, (2002) 58, 579–594. T. Tanaka, Reproductive and neurobehavioural toxicity study of Ponceau 4Radministered to mice in the diet. Food Chem. Toxicol. (2006) 44, 1651–1658. J.S. Piccin, M.L.G. Vieira, J.O. Goncalves, G.L. Dotto, L.A.A. Pinto, Adsorption of FD&C Red No. 40 by chitosan: Isotherms analysis. J. Food Eng. (2009) 95(1), 16-20. S. Tsuda, M. Murakami, N. Matsusaka, K. Kano, K. Taniguchi, Y. Sasaki, Toxicol. Sci. (2001) 61, 92–99. C. Hessel, C. Allegre, M. Maisseu, F. Charbit, P. Moulin, Guidelines and legislation for dye house effluents. J. Environ. Manage. (2007) 83, 171–180. J.F. Gao, , Q. Zhang, J.H. Wang, X.L. Wu, S.Y. Wang, Y.Z. Peng, Contributions of functional groups and extracellular polymeric substances on the biosorption of dyes by aerobic granules. Bioresource Technol. (2011a) 102(2), 805-813. A. K. Verma, R. R. Dash, P. A. Bhunia, A review on chemical coagulation/ flocculation technologies for removal of colour from textile wastewaters. J. Environ. Manage. (2012) 93, 154–168. Y.L. Gao, C.M. Li, J.Y. Shen, H.X. Yin, X.L. An, H.Z. Jin, Effect of food azo dyetartrazine on learning and memory functions in mice and rats, and the possible mechanisms involved. J. Food Sci. (2011b) 76(6), T125-T129. S. Kobylewski, M.F. Jacobson, Toxicology of food dyes. Int. J. Occupational Environ. Health, (2012) 18(3), 220-246. G. Crini, P.M. Badot, Application of chitosan, a natural aminopolysaccharide, for dye removal from aqueous solutions by adsorption processes using batch studies: A review of recent literature. Prog. Poly. Sci. (2008) 33(4), 399-447. T. Robinson, G. McMullan, R. Marchant, P. Nigam, Remediation of dyes in textile effluent: a critical review on current treatment technologies with a proposed alternative. Bioresource Technol. (2001)77(3), 247-255. M. Khabazipour, Sh. Shariati, F. Safa, SBA and KIT-6 mesoporous silica magnetite nanoparticles. Syn. React. Inorg. Met. (2016) 46, 759-765. V. Janaki, K. Vijayaraghavan, B.-T. Oh, K.-J. Lee, K. Muthuchelian, A.K. Ramasamy, S. Kamala-Kannan, Starch/polyanilinenanocomposite for enhanced removal of reactive dyes from synthetic effluent, Carbohyd. Polym. (2012) 90, 1437–1444. H. Kefayati, S. J. Bazargard, P. Vejdansefat, S. Shariati, A. M. Kohankar, Fe3O4@MCM-41-SO3H@[HMIm][HSO4]: An effective magnetically separable nanocatalyst for the synthesis of novel spiro[benzoxanthene-indoline]diones, Dyes Pigments (2016) 125, 309-315.
nanoparticles as a recyclable core–shell solid acid catalyst for three-component condensation of indoles, aldehydes and thiols, RSC Adv. (2014) 4, 41469- 41475. F. Bandari, F. Safa, S. Shariati, Application of response surface method for optimization of adsorptive removal of eriochrome black T using magnetic multi-wall carbon nanotube nanocomposite, Arab J. Sci. Eng. (2015) 40, 3363–3372. M.A.M. Salleh, et al, Cationic and anionic dye adsorption by agricultural solid wastes: A comprehensive review. Desalination, (2011) 280(1), 1-13. B. Nandi, A. Goswami, M. Purkait, Removal of cationic dyes from aqueous solutions by kaolin: Kinetic and equilibrium studies. Appl. Clay Sci. (2009) 42(3-4), 583-590. S. Mohan, N. Rao, J. Kartikeyan, Adsorptive removal of direct AZO dye fromaqueous phase onto coal based sorbents: a kinetic and mechanistic study, J. Hazard. Mater. B (2002) 90, 189–204. Y. Ho, G. McKay, Sorption of dye from aqueous solution by peat, Chem. Eng, J. (1998) 70, 115–124. I. Kiran, T. Akar, A. Özcan, A. Özcan, S. Tunali, Biosorption kinetics and isothermstudies of acid red 57 by dried cephalosporiumaphidicola cells from aqueoussolutions, Biochem. Eng. J. (2006) 31, 197–203. Y. Hamzeh, A. Ashori, E. Azadeh, A. Abdulkhani, Mater. Sci. Eng. C. (2012) 32, 1394–1400.